I had been looking forward to getting to Panama City for a while. Not entirely for the city, but for what it marked. 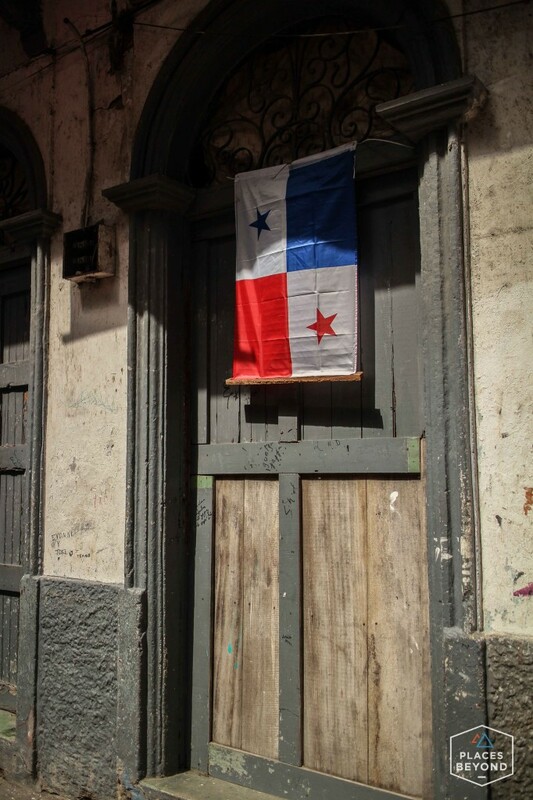 Panama is the end of the first stage of my trip. Originally planning on taking 3 months to get from California to Panama it was shortened to just 2. Doesn’t seem like long ago that I left but looking over my route, I’ve come a long way. 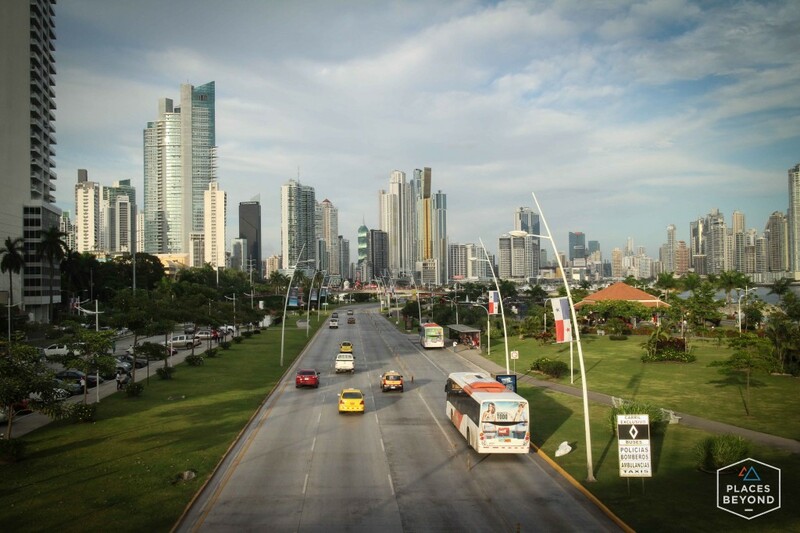 Riding down the Pan American highway into Panama City I was awestruck by the skyline. 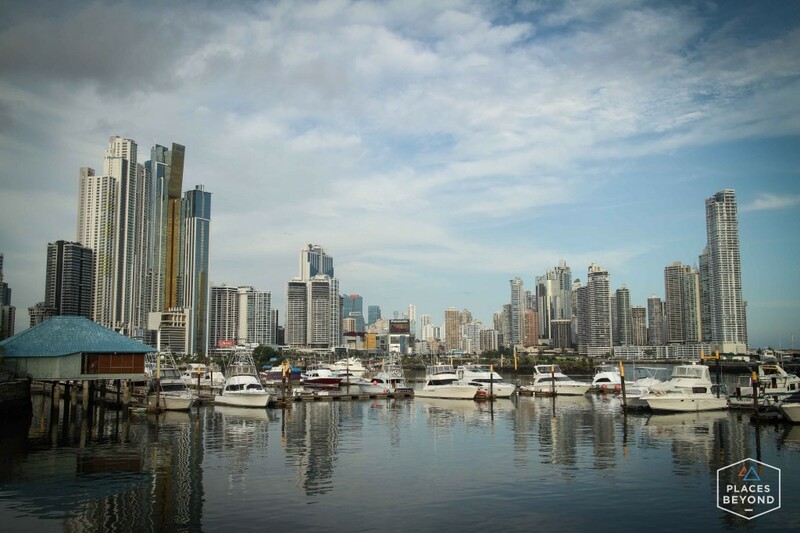 Panama City is towering with sky scrapers along the city’s waterfront. Nowhere else that I’ve traveled to since Mexico City has a skyline that comes close to this. From a distance the city looks glistening and along the waterfront it is. Once I got off the main road the shiny skyscrapers were surrounded by neighborhoods in disrepair. I had looked up a hostel online and it had good reviews and parking for my motorcycle so I went there. 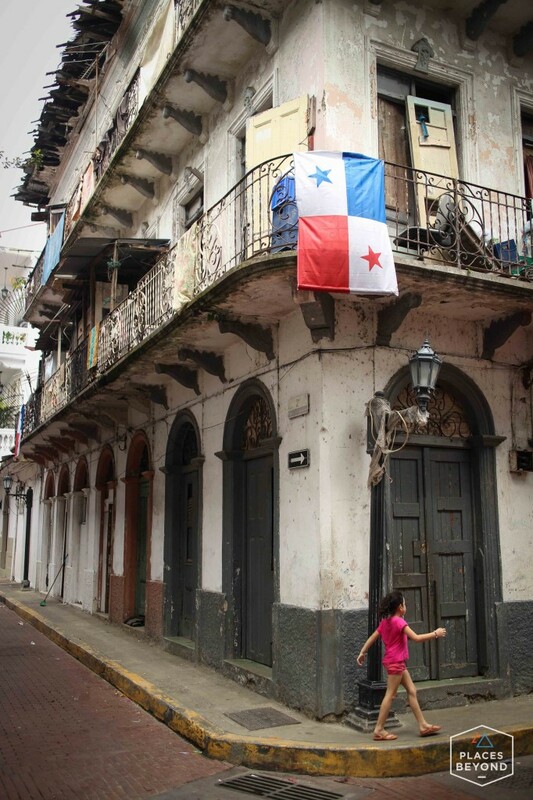 Mamallena Hostel is just on the outskirts of one of the poorer areas of Panama City. Places like this have so much character in the grittiness. Along the waterfront is the fish market where the fishing boats unload, the fish are cleaned, and then sold in the market. 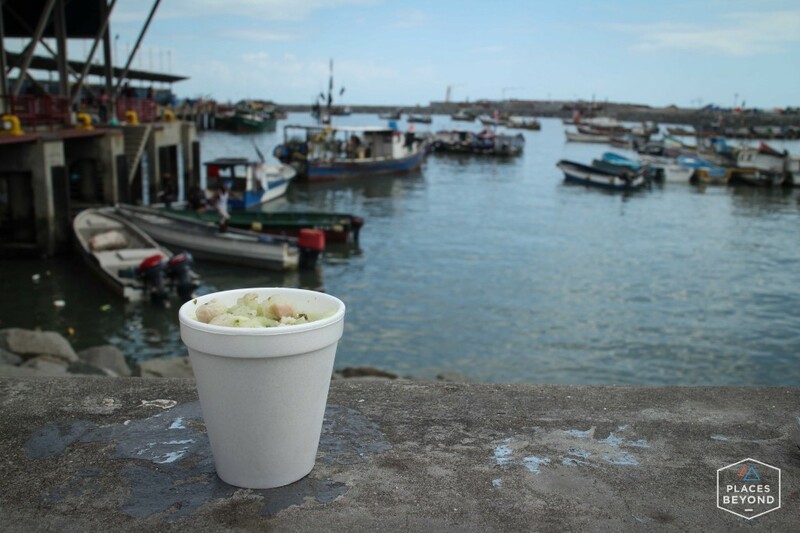 The smell in the area is not easy to ignore but with restaurants selling dozens of different ceviche dishes I held my breath and ordered a cup. $1.25 for a cup of fresh ceviche. 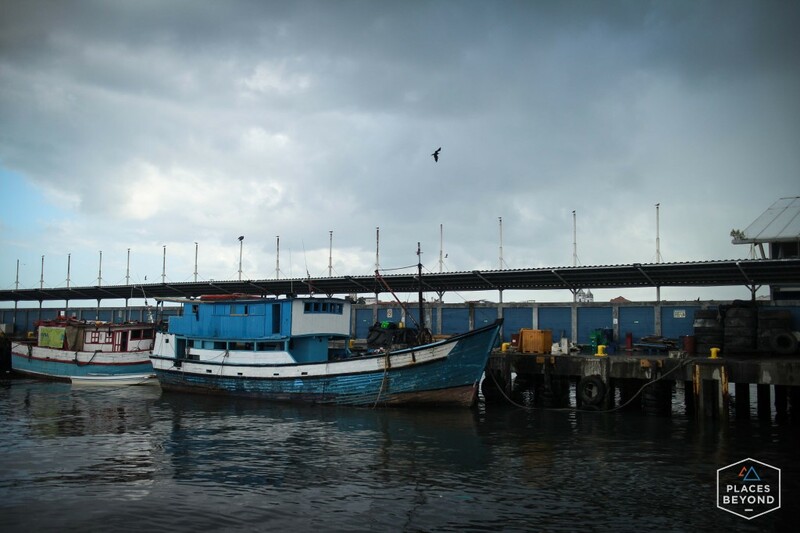 Away from the busy market I sat on the harbor wall and watched the boats unload. 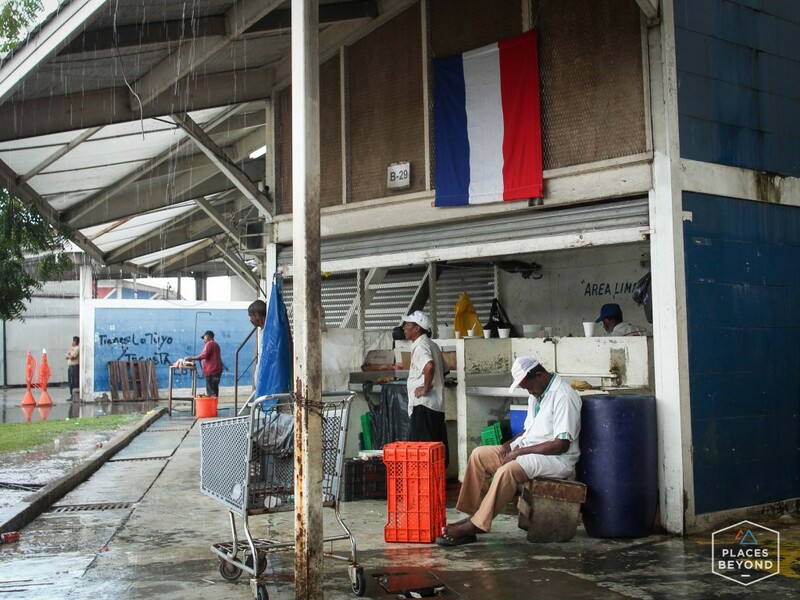 At the fish market where they clean the fish. This guy was catching a nap before the next load of fish arrived. I just happened upon the fish market as I was trying to find the Casco Viejo neighborhood. 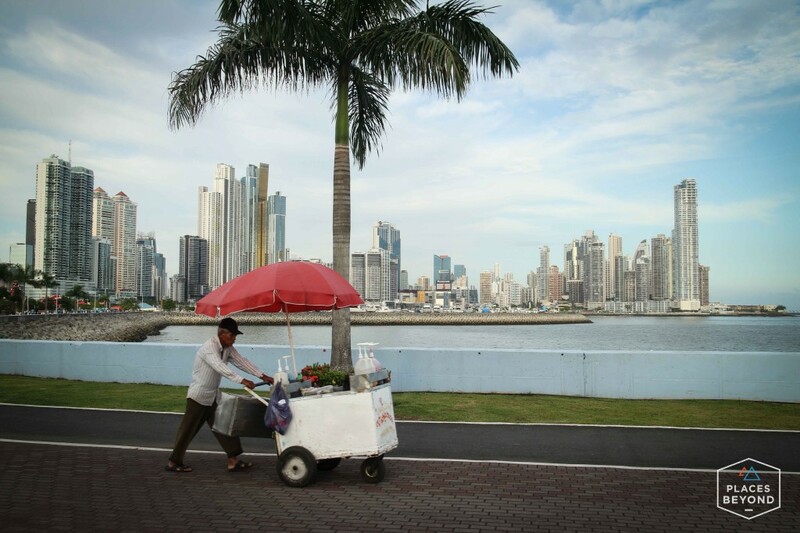 Further along the waterfront on a small peninsula is Casco Viejo, one of the older neighborhoods in the city. If you’re going to walk here, stick to the side of the street here the water is. The other side of the street is one of the sketchiest blocks I’ve walked through. 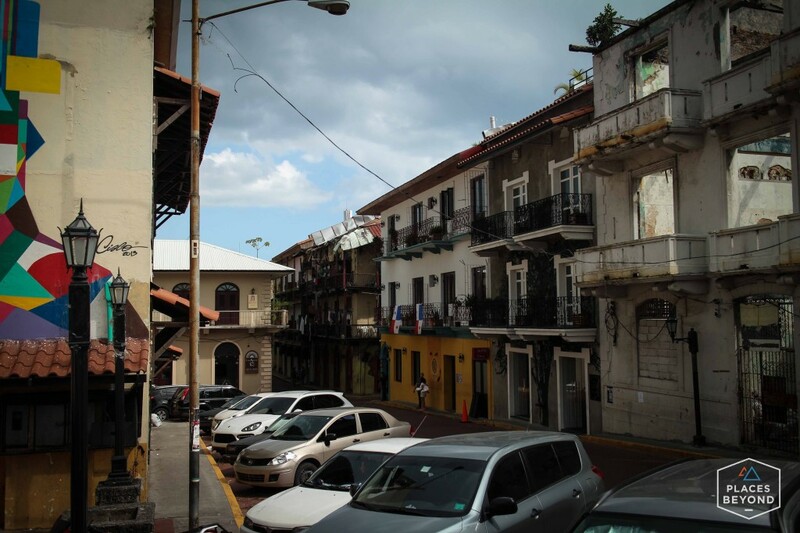 Casco Viejo is a world heritage site as most of the original 16th and 16th century buildings are still standing. Many of them have been renovated and it’s become a hot spot for the wealthy. In one block there will be a 5 star hotel and right next to it a building with the roof caving in and shutters falling off, but with several families living in it. Built by the French and Spanish it reminded me of New Orleans, just without the trashiness of Bourbon Street. When I told people that I would have to sail from Panama to Colombia, a few people though it was because the Panama Canal. No, there are bridges that go over that. But it does signify the divide of continents so I wanted see it up close for myself. 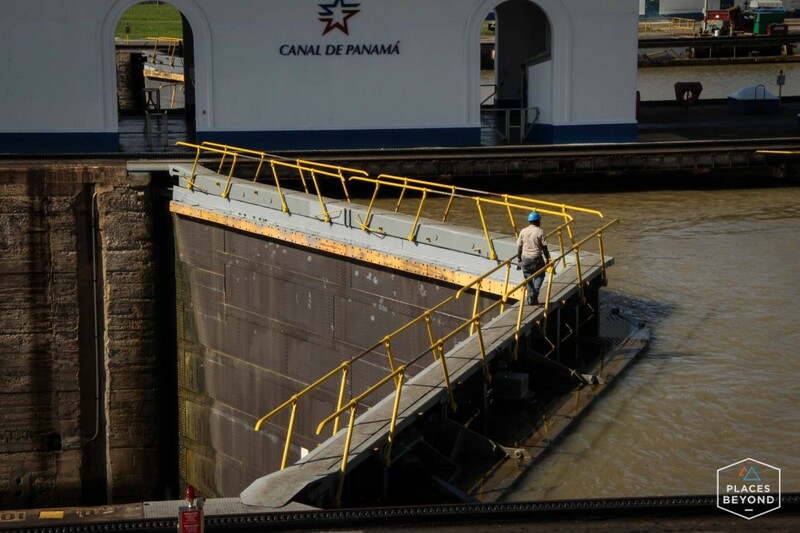 The Miraflores locks were only a 10 minute ride from Hostel Mamallena so I took the bike for a day tour around the city. 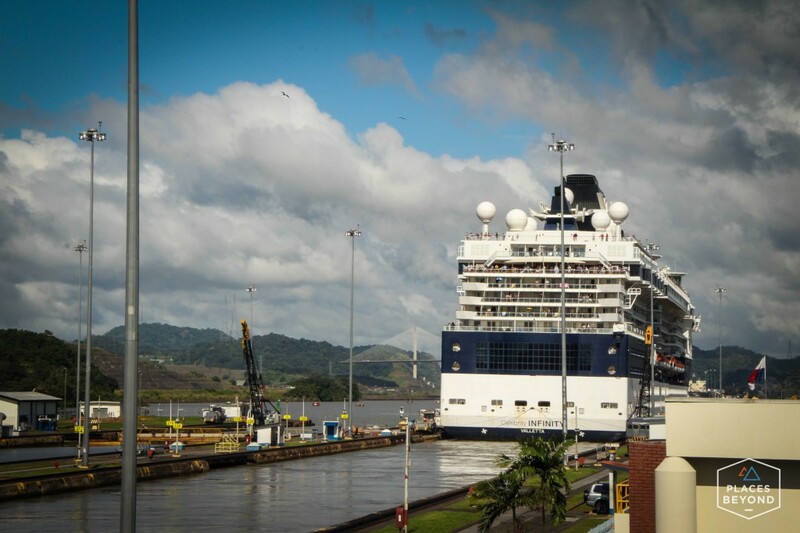 When I arrived at the Miraflores Locks, the first set of locks on the Pacific side, a large cruise ship was passing through. I raced up to see the process. 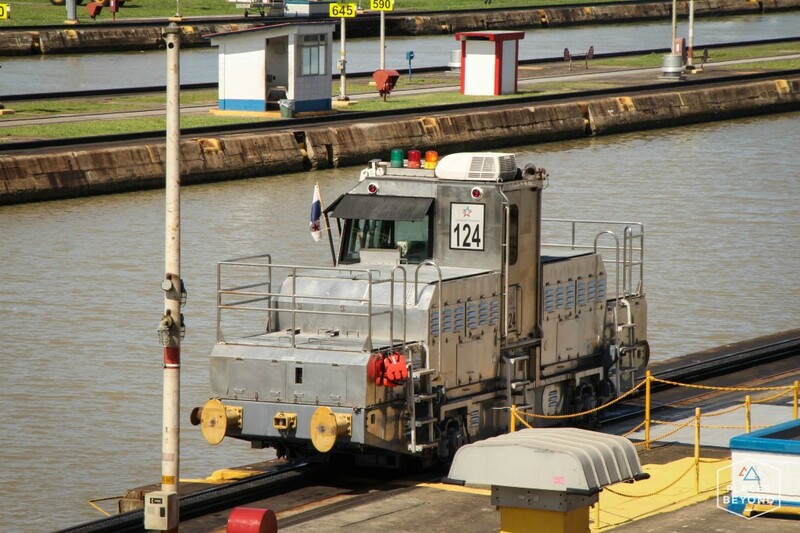 The Panama Canal is 51 miles long from the Pacific to the Atlantic Ocean. It saves ships days of travel to sailing around South America and thousands of dollars in fuel. It takes only 8-10 hours to get through the canal but there’s a high price tag. Tolls are charged based on size, cargo, and other factors. 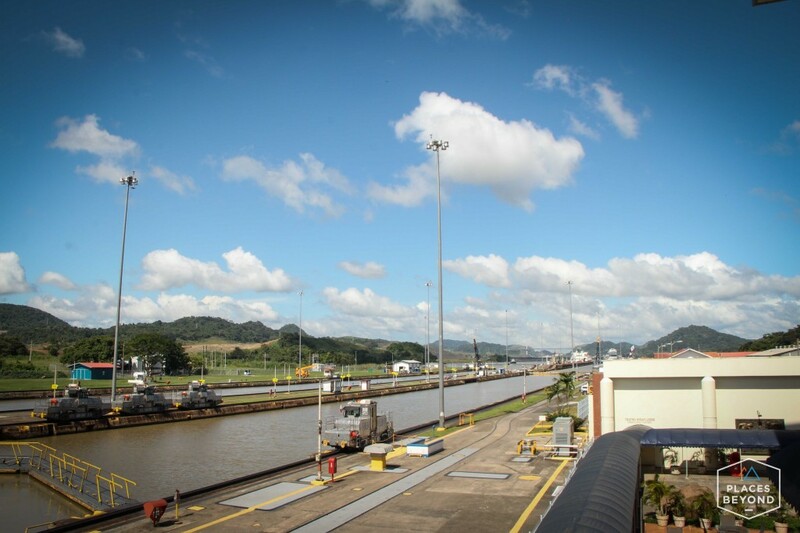 The highest toll paid to cross the Panama Canal was set in 2010 when the cruise ship the Norwegian Pearl had to pay $375,600 to pass through the canal. The smallest toll ever was for 36 cents for a guy who swam the canal in 1928. 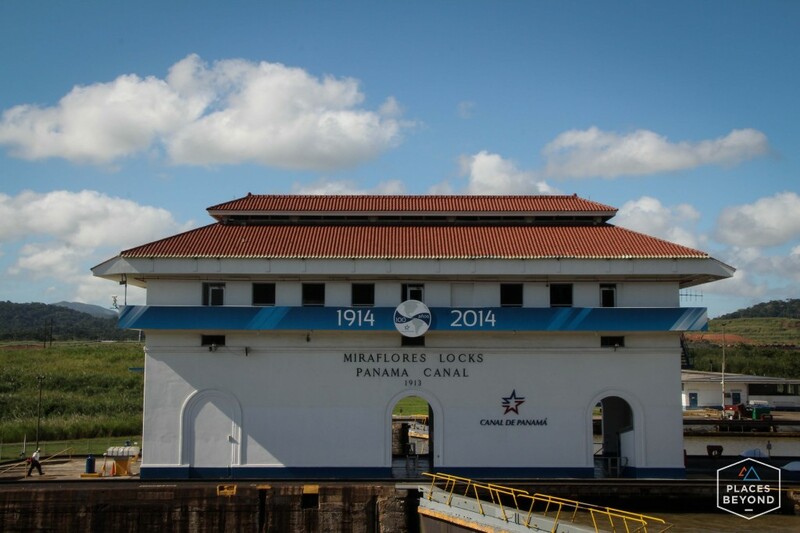 The first set of locks that bring the ships up from sea level to the level of the lake. 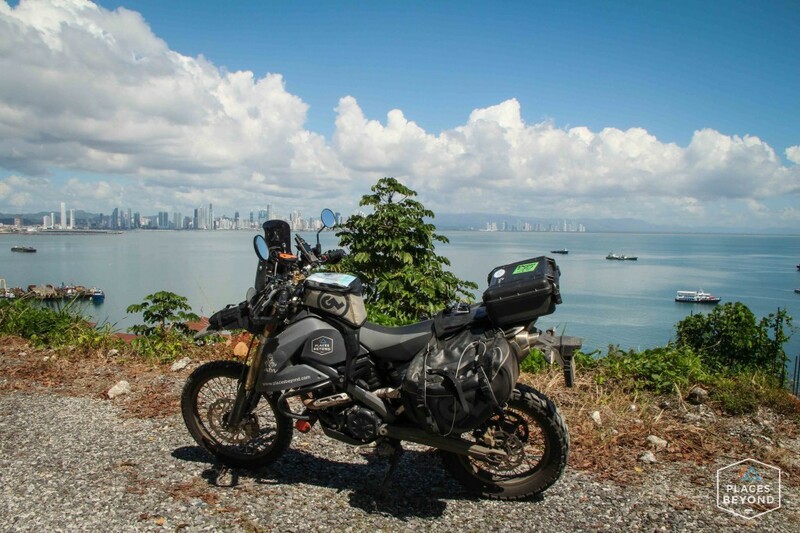 After the canal I rode out onto the Amador Causeway and up a dirt road that spriral up Flamenco Island, giving me a beautiful panorama of Panama City. As I came around a corner on the dirt road a big dog started charging at me from up the road. That was my cue that I was probably on private property and should leave. I spun the bike around and got out of there as fast as I could. I could hear the dog still barking behind me. I raced down the dirt trail until I reached the pavement again. The dog stopped chasing me and I settled for this view of the city. On Sunday I took a cab to the Canal Zone to go to a church for the night service. It was a small church with maybe 50 people there. By the end of the service I had met a group of people who invited me out to dinner. A couple of the guys were local surfers and skaters who had set up Panama’s first indoor skate park. After dinner they offered to drive me back to the hostel even though it was 30 minutes out of their way. Later in the week I went out to a small town in the Canal Zone to help out a missionary who runs a place called Casa Paraiso. Casa Paraiso is a organization that operates a lodge that churches, schools, and other groups can stay at while doing short term missions or trips in the area. Dan and his family have been in Panama for the better part of 10 years. He and his wife teach at an international school and he spends the rest of his time running the lodge and working with other missions organizations in the area. I spent the day working with Dan on some small tasks that needed to get done before they could renovate one of the rooms. I wanted to go back the next day but I had some work to do on the motorcycle before riding to the port. I forgot my camera when I visited the church and helped out at Casa Paraiso. I wish I could share pics of the people I met. Once again, I’m thankful for the unplanned meetings that fuel and inspire me. Really good post.. How has your viewpoint on the poor economy situation in the USA changed since going on this trip? Are things really as bad here as they seem in America, or are we just in a transition period? Hopefully our country doesn’t get run down too much more! Keep up the awesome and honest narration.  Places Beyond supports victims of human trafficking.  Donate to help International Justice Mission bring freedom to thousands of people around the world.